Fayetteville's new transportation museum and Amtrak Station (ACL, c.1911) waiting room expansion and platform improvements will be the feature attractions of the meeting - rescheduled from the traditional second weekend in June, in order to coincide with dedication events for both facilities. Saturday's activities will begin at 10:30 a.m. at the Cape Fear & Yadkin Valley Railroad Depot. The depot has undergone a multi-year, multi-million dollar transformation into the Fayetteville Area Transportation Museum. Built in 1890, it is located in the middle of the Fayetteville central business district (CBD), at the corner of Ray Avenue and West Russell Street. At the station we will be briefed by Mr. Bruce Daws, City of Fayetteville Historic Resource Manager, on the history of the station, its restoration and transition into an area transportation museum. Following Mr. Daw's presentation and tour, we will break around noon for lunch. There are several excellent restaurants all within one to two blocks of the station and the afternoon location for our board meeting. These include Pierro's Italian Bistro and the Huske Hardware House Brewery and Restaurant, both on the south side of Hay Street and less than two blocks from the depot. The afternoon board and business session will begin around 1:15 p.m., or as soon as we can reassemble following lunch. The location will be the Fayetteville Arts Council building on Hay Street, about midway between Huske and Pierro's and on the same side of the street. At the conclusion of our meeting, there should be ample time to wander the two blocks down to the Amtrak Station to check out the expanded waiting room and the new passenger platform (eight inches above top of rail - from either rail height or in some cases below) along with vastly improved canopy lighting. If you come for an overnight visit, you will need a place to stay. Since all of my spare bedrooms are filled up with car parts (I am restoring a 1957 Chevrolet and have taken it completely apart) you will need to find a place to sleep. The Prince Charles Hotel (a Clarion Property) is ideal, as it is perfectly located between the Amtrak Station and the Arts Council right on Hay Street and less than two blocks from the Transportation Museum and three from the Market House Square. It has been the site of two Region 5 NARP meetings (1995 and 2003) as well as having hosted at least two CAPT luncheon meetings in the past. We have been given special rates of $73 per night for a regular room (king or twin beds) and $83 for a suite which will sleep a third on a fold-out couch. To book a reservation, you must do so directly with the hotel at 910/433-4444 since the Clarion national reservations desk has no idea what the Carolinas Association for Passenger Trains is. For more hotel information, see Choice Hotel. If you don't have an NCDOT transportation map, here is an Amtrak map. If you want to come by train*, Amtrak currently has a "two can ride for the price of one" promotional. The fare code is H 609 and reservations must be made at least three days in advance of travel. * This would be either the Meteor or Palmetto, and will only work if you plan to stay overnight. The Palmetto no longer has those early and mid-morning arrivals from the south. To give us some idea as to how many to expect, please let me know if you plan to attend, by replying to my e-mail address: dmstewart2@aol.com. Also, please let me know whether you plan to come by train and whether you'll be arriving on Friday evening. The Fayetteville Area Transportation Museum (a.k.a. 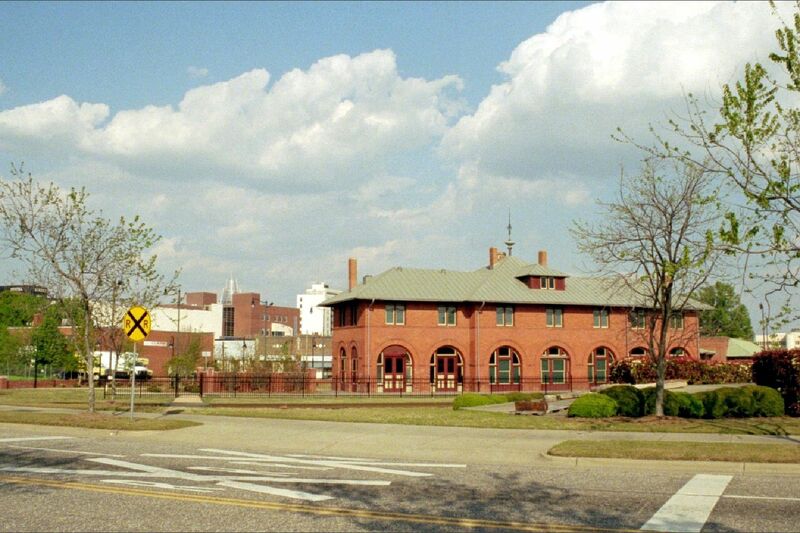 Cape Fear & Yadkin Valley Railroad Depot) as seen from the intersection of Ray Avenue and West Russell Street, looking east towards the Market House Square (at the tall white building in the background).